I really love this ice cream. Really. Hence why I've been making it daily for the past week. Hence why I wish my ice cream maker didn't have to be re-frozen for 24 hours between each batch. Or maybe that's a good thing. Otherwise I would probably be eating it for breakfast. I'd probably even bring my boss some for breakfast if they were to ask nicely. Funny thing. It is so full of healthy ingredients you COULD eat it for breakfast. And not feel guilty. As you may or may not know, my daughter is on a gluten, egg, dairy, soy and peanut free diet. And I'm on the Candida diet. So there is a long list of things we can't, won't or shouldn't eat. I was struggling to find us an ice cream that we both liked that was vegan, low sugar and relatively low fat. The low fat part only because I eat so much fat during my other snacks/meals that I don't want to overdo it. Some days I feel like I live on nuts. But after many failed and some mediocre attempts - this one was a winner. 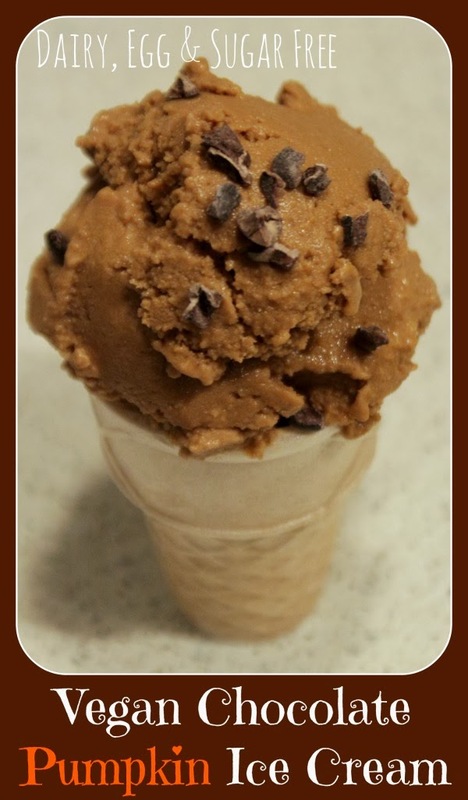 The leaves are falling, the air is getting brisk and here I am FINALLY sharing an ice cream recipe. I got my ice cream maker before summer. That's how long it took me to nail down a recipe that I wanted to share. I actually gave up on the experiments for a while as they weren't working. But it is working now. Is it ever. And I'm loving it. Its got pumpkin in it at least. So it is totally a fall appropriate recipe. Don't you think? Hint: you can skip the cocoa and add some pumpkin pie spice instead if you want to really make it Fall worthy. Just sayin'. And I really would bring some for my boss. I put all the ingredients in my Bullet (or blender) and pulse until fully combined. Pour into ice-cream maker and prepare according to manufacturer's instructions. I have a Cuisinart and it takes about 25 minutes to turn into ice cream. You can eat immediately (I can never wait) or transfer to a container and put in freezer for about 1/2 hour before serving.